There was drama on the high seas on Sunday as the Volvo Ocean Race leader suffered a setback in the Pacific. "The main thing is we got him back on board, he is safe. But I think it just showed everyone how hard it is to actually see the guy in the water, even on a sunny day, 18 knots and sunshine, you know you wouldn't want to be doing it in 20 knots in the dark. I don't think you would find him you know." 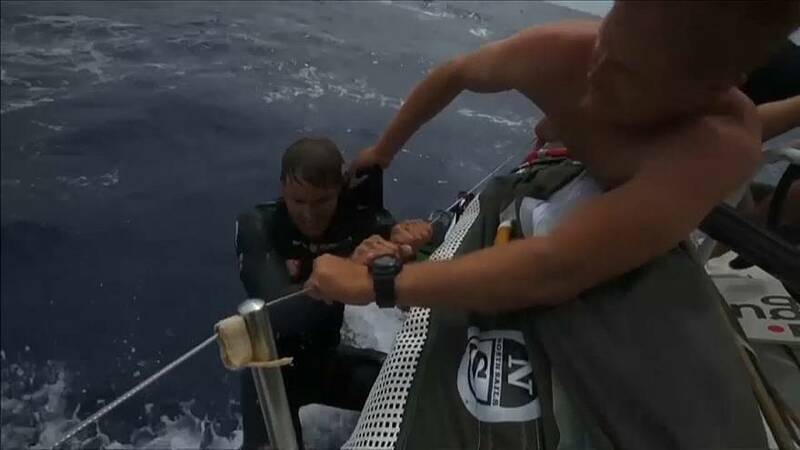 Team Hun Sung Hai/Scallywag had to carry out an emergency procedure to recover Alex Gough who fell overboard at speed. It was a fortunate end for the sailor as he wasn't wearing a safety tether or a life jacket. The fleet of seven boats is heading north to the Philippines and end leg four from Melbourne to Hong Kong, with some 2,000 nautical miles remaining. Losing at least five nautical miles, the 22-metre (72 foot) craft was worked back to pluck Gough from the water. Skipper David Witt said Gough should have been tethered, or at least informed him, before climbing onto the boat's outrigger. A heavy sea bucked Gough into the water and the crew had difficulty spotting the sailor in the ocean as they returned to fetch him. Witt told Gough the only time he had been seen was when he waved his arm above his head. Team Hun Sung Hai/Scallywag has a lead of about 13 nautical miles over second placed Team AkzoNobel with Dongfeng Race Team not far behind.